Riah Phiyega, former and disgraced National Commissioner of Police, has challenged the veracity of a sentence in my critique of the SCA judgment in the Jiba and Mrwebi appeals. I commented: ‘Of his (i.e. Zuma’s) second choice, Riah Phiyega of Marikana mendacity infamy, the less said the better.’ I have been asked by her, in a screaming headline, to furnish the evidence supporting my view. I do so gladly. This is a response to the article, What is Paul Hoffman’s evidence of my mendacity, deceit and dishonesty? Mendacity means a tendency to lie. It is now common cause that the decision that the strikers would be forcibly removed from the koppie by the police on 16 August 2012 if they did not voluntarily lay down their arms was not taken by the tactical commanders on the ground at Marikana on that day but rather by Lieutenant General Mbombo and “endorsed‟ by the SAPS leadership at an “extraordinary session‟ of the NMF held after its ordinary meeting was over on the evening of 15 August 2012. Some of the members had left but those present apart from the National Commissioner, were all Provincial Commissioners and the Divisional Commissioner for Operation Response Services and the Head of Crime Intelligence – 297 exh JJJ 177 Minutes, Extraordinary session of NMF. The information made available to the Commission regarding this meeting is limited. In an endeavour to obtain more information on the point a questionnaire was sent to the members who were present there and they were asked to submit affidavits to the Commission answering the questions posed. Two of those members, both of whom are no longer members of the SAPS, failed to respond. Inevitably, the Farlam Commission was followed by a Board of Inquiry into Phiyega’s fitness for office. As is her right, she chose not to give evidence in that inquiry. She was probably advised that her evidence could only make matters worse for her, given her poor showing under cross examination and during questions in elucidation while in the witness box at the Farlam Commission. She is now stuck with the consequences of her election not to give further evidence. As Phiyega produced no countervailing evidence, she is stuck with this finding, and no properly conducted judicial review is ever going to reverse it. While it is so that Phiyega launched two judicial reviews, until such time as the reviews are heard and the findings alluded to above are reversed in a final determination of the reviews, they stand. Two reputable senior judges have created a basis for my comment that Phiyega is mendacious. Their findings are good enough for me. Neither review has been argued, and now that Phiyega’s term of office, much of it spent on fully paid suspension, has ended there is little point, other than attempting to assuage her injured feelings, in enrolling them for hearing. 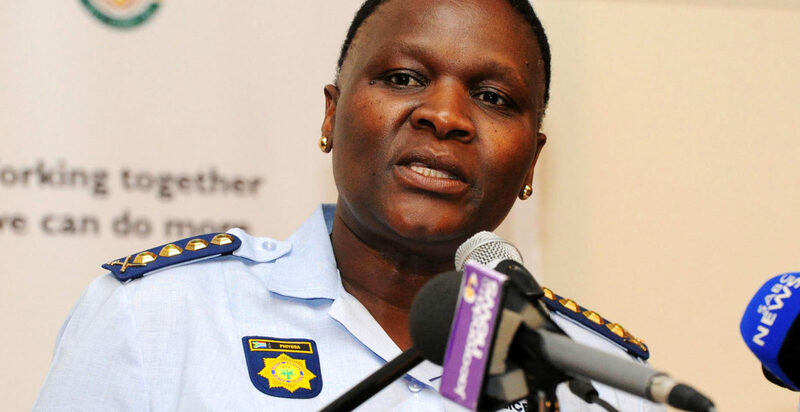 It gets worse, as a perusal of Phiyega’s rant reveals. Falsely accusing me of all manner of terrible motives, actions and statements is itself mendacious. Phiyega’s assertion that I mention the race of the judges in the Jiba case is false as is her hysterical screeching about corruption, stealing, shooting and giving commands to shoot, none of which are mentioned in the piece that has lodged itself so firmly up her nose as to provoke an intemperate and inaccurate attack on me. It seems that Phiyega was not paying attention in Sunday School when the topic “Thou shalt not bear false witness” came up for discussion. I do not intend to dignify the playing of the race card by Phiyega with a detailed response. This stratagem is the last resort of scoundrels who have no better argument to offer. Phiyega has obviously not bothered to find out who I am and that I was not born with any silver spoon in my mouth. A brief visit to the Accountability Now website would have spared her the embarrassment of spewing false bile about me in public. For the record: I am fully in favour of the transformation contemplated by the Constitution and implacably against cadre deployment in the public service as well as all other aspects of the National Democratic Revolution, which is, for now, the policy agenda of the ANC-led alliance. Upon her appointment Phiyega was asked by a reporter whether she was a deployed cadre. She declined to answer the question. Phiyega is right in one respect: it is true that other people’s rights, dignity and feelings have to be respected. Would that she had acted on these sentiments in relation to the widows of Marikana. Instead, she publicly congratulated the police on a job well done after the massacre. Her own rights, dignity and feelings have to bow before the public interest in getting a police service that serves the people, not a police force that terrorises, kills and maims them. A functional police service cannot be properly led by a person with no experience of policing who is no more than a deployed cadre carrying a line of unearned medals on her chest and pursuing a revolutionary agenda aimed at making SA into another Venezuela, Zimbabwe or North Korea. There is huge irony in the fact that Phigeya was propelled into office because her predecessor, Bheki Cele, was found to be dishonest and incompetent by the Moloi Board of Inquiry, which recommended that he be investigated for corruption. Had Phiyega put those investigations in hand, as she should have done, he may not have been appointed as Minister of Police by the new administration. I will continue my “counter-revolutionary” activities and no amount of noise from Phiyega and her ilk will dissuade me.